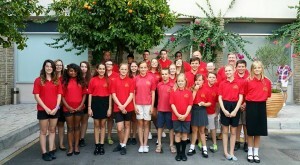 The Cyprus Music Service (CMS) was formed in the Autumn Term of 1999. The aim of the CMS is to make instrumental tuition available to Service children educated in Cyprus and to provide musical opportunities that will enrich their lives and build skills for the future. Firstly, the pupil will receive small group lessons in school during the school week. All the CMS staff are highly qualified instrumental specialists who will be available to teach a minimum of 30 lessons per academic year. Secondly, after an initial period of tuition, the pupil will be expected to attend a Music School which operate at the Music Centre – in King Richard School. This operates at various times during the week, outside normal school hours. It is there that the pupil will experience playing in larger bands, orchestras and other instrumental ensembles. Tuition is primarily in woodwind, brass and stringed instruments. Should timetabling, staffing and schools permit; CMS will consider applications for other instruments.